For more in depth information on the history of this awesome place, check out our other article from last fall. Of all of the sets of historical ruins within this state, the Tunnelview Historic Site in Tunnelton, PA, straddling the border of Indiana and Westmoreland Counties, is one of my favorite places to explore. It is a tough call if I prefer this, or the Abandoned Pennsylvania Turnpike. We start off with a view of the area that required all of this major infrastructure. Bow ridge is an area with rugged terrain that required creative ideas to bypass for the old Pennsylvania Canal, and later, the Pennsylvania Railroad. There was an immense mountain that needed to get bypassed. There were no flat routes surrounding the area, so the solution was to build tunnels right through the mountain. The bend is now dammed up for flood prevention as a result of devastating floods, such as the 1936 St. Patrick's Day flood, a flood that caused tremendous damage to the entire region. A 144 foot tall dam was erected, and the Conemaugh River Lake was created. When that was built, the rail tunnel was closed off and plugged, in addition to the other two tunnels at the site, which we will cover later. The stunning arch bridge is from the 1907 alignment of the railroad. It leads into the first abandoned tunnel that we will check out. The large iron bridge was the result of a realignment in 1952 that was a massive undertaking that made it possible to cross over the ridge without a tunnel. The flooding of this area made the two rail tunnels too low and unable to withstanding major floods. The 1907 Arch Bridge is stunning. The end of the arch bridge leads right into the third Bow Ridge Tunnel. This spot is one of the most well preserved, major transportation infrastructure spots that there is, and one of the best collections of tunnels around. One of the best parts of the arch bridge? You can drive right up on it! The bridge is still functional. These bridge piers are from the 1864 alignment and tunnel of the Pennsylvania Railroad. They lead into the second Bow Ridge Tunnel, which we will check out in a little bit. In the background you can see the large Conemaugh River Lake Dam. The lead into the 1864 alignment bridge. 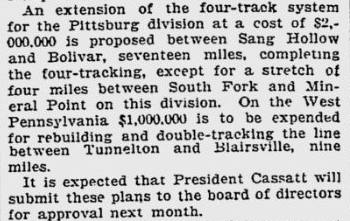 Here is an excerpt of a newspaper story from the Boston Evening Transcript on November 27, 1905, proposing double tracking this section of the rails. The old tunnel, as well will soon see, was a single tracked tunnel that did not have the capacity to cover the main rail route between Philadelphia and Pittsburgh. Additionally, this tunnel was much lower and susceptible to flooding. The proposed solution to both the capacity and flooding issues was boring this tunnel, the third that would be built at the site and opened in 1907. Now back to the end of the 1907 arch bridge. Now we are coming up to the portal of the 1907 Bow Ridge Tunnel, the third tunnel built in this general area. The rails and ties remain intact. Even though the tunnel is gated, I think this is for the better. The tunnel is like a frozen time capsule of the rail history. Compared to many other rail tunnels that were left abandoned and unsealed, this one is practically untouched. Aside from the gates and the portals, and a twenty foot plug of cement on the other end of the tunnel, Bow Ridge Tunnel remains practically the same as it was during operations. As nice as it would be to be able to walk in the tunnel, I am glad that they keep it scaled for the purpose of protection from vandals. This, and the other two abandoned tunnels that we will talk about, were sealed with cement in order to prevent the water from flowing through them and circumventing the flood control dam, an absolutely critical project to the sustainability of Pittsburgh. The keystone and dedication stones at the top of the tunnel. A.C. Shand was the chief engineer, and McMenamin & Sims were the contractors of this 630 foot tunnel. I have said this before and I will say it again, Mother Nature is an awesome sculptor. So beautiful. Mother Nature is having her way with this rail tunnel, that looks almost untouched since abandonment. The plugged end of the tunnel. A closer look at these stalagmites. Now we head over to the 1864 alignment of the railroad, with the bridge piers amazingly still intact. It almost looks as if you could rebuild a bridge deck atop of these piers without any issues. Think of just how many dire floods have traveled through this section of the river, and just how impressive it is that these piers have sustained the flow for 156 years with 109 years without maintenance. That is pretty incredible. Here is the second Bow Tunnel, from the 1864 alignment. This is considerably lower than the 1907 tunnel and it is single tracked. As mentioned earlier, these problems needed to get resolved. This tunnel also has a small fence, but the plug is closer to this end, since the portal on the other side is fully submerged within the reservoir. The original cut into the hillside. You can really see how this was done by hand and how much effort went into these old tunnels. It is also amazing that the rails and ties have somehow survived within this tunnel too. The view out of the tunnel. On the center left, you can see one of the bridge piers sticking out. It is pretty easy to see how the old bridge had a large curve in it, similar to the arched bridge of the 1907 alignment. Looking over what would be the railroad trestle. Now for the hiking. The West Penn Trail, a National Recreation Trail that is 17 miles long and goes through the park, provides an excellent opportunity for hiking and biking. You would have to walk your bike through the section we are hiking through right now, but otherwise, the bulk of this trail is on old rail grade. We are now standing at the top of the ridge, looking down upon the Conemaugh River Lake and the arch bridge that meets the opposite end of the 1907 tunnel that we checked out earlier. The reservoir is largely frozen over, and the old bridge sits inundated with water. During heavy rain periods, this bridge is fully submerged. The fact that this bridge is not only still standing, but also passable, after 60 years of being submerged in a reservoir, is a true testament to how well these old bridges and tunnels were built. The bridge was certainly not designed to stand nearly completely underwater, yet somehow this bridge still stands strong. This is a FUN hike! Great elevation change and decent maintenance, in addition to some nice snow pack. I love being outdoors in the winter, if you have not noticed. You can see a mini ice jam here on the other side of the old arch bridge. No worries though since it is in a flood control reservoir. Now we have descended down to the level of the bridge. The ice stalagmites on this side are not as large, but still neat, nonetheless. The tunnel plug to ensure that the reservoir does not circumvent the dam through this tunnel. Now looking out of the tunnel portal to the old bridge. It is also pretty amazing with both this and the 1856 tunnel, that the old blocks are still pretty tight. Here you can see where the fourth tunnel at this site is located. The fourth tunnel is used for hydroelectric power production and it came on line in 1989. The second Bow Ridge Bridge that makes sure the railroad does not necessitate the usage of a tunnel through this portion of the river. Now out on the mostly submerged bridge and looking down the West Penn Trail. A view of the tunnel portal from the old bridge. Looking towards where the first and second Bow Ridge Tunnels are located, buried in the hillside/reservoir. The fourth tunnel is towards the end of the shoreline in this picture. One last view of this side of the ridge! Now back over to the other side again. The first tunnel built at this site has not been mentioned in this article yet. This is one of the coolest tidbits of history within this location. The Pennsylvania Canal was an ambitious, state run system, that ran a canal from Philadelphia to Pittsburgh. In intermittent areas, such as the Allegheny Portage area, the right-of-way of the canal ran by rail. The canal ran as a canal in this area. Two bridges crossed the Conemaugh River, and a tunnel was built into Bow Ridge, only the third tunnel EVER made. It was built in 1830 and artifacts from this are scarce, but they are around. We will go find them now. So this is the general area that the tunnel was. Hmmmmm. That small building on the left is the end of the fourth tunnel that is used for hydroelectric production. The bridge pier is from the 1856 second tunnel. We are currently standing on the 1907 arch bridge to the 1907 tunnel. The canal tunnel was located between the 1856 and 1907 tunnels. I believe we have found it! It looks like it could be a drainage pipe, but this is the right location for where the tunnel would be located. Another view of that tunnel. Is anyone sure if this is the canal tunnel? I am certain it would be much wider, but this is the right location for it. It points directly out to where the remaining bridge piers are located. Notice that block of concrete that is that slight discoloration in the water. That is one of the bridge piers from the canal aqueduct. Anyways! You need to check this place out for yourself. Exploring/investigating the artifacts at this site is a ton of fun to do. We were there this past summer. Amazing place how these structures have held up. Our forefathers were great engineers. Your pictures are great. We planned on going back in the early Spring before the leaves are on the trees but I like the views with the snow.